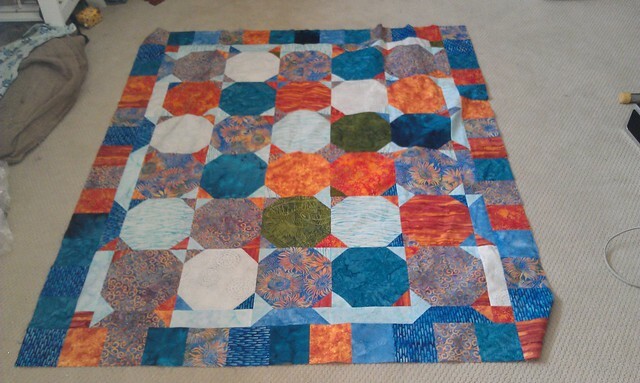 For Christmas, I got some Flea Market Fancy from a quilting friend. 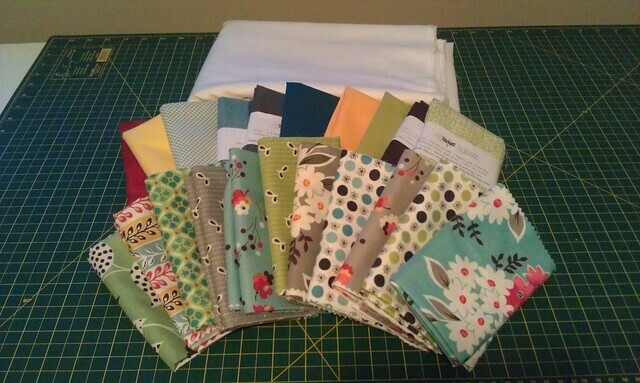 I added some solids and tone on tones to the Fat Quarter pack. Sometimes, I work late at night and my sewing room has pretty sad lighting. So forgive the not so great pictures. I've also got to use a camera that isn't part of my phone. And sometimes I make good fabric choices (see the block on the right) and sometimes I make baaaaad choices (block on the left). But I rarely regret doing the tutorials/quilt alongs at PS I Quilt. 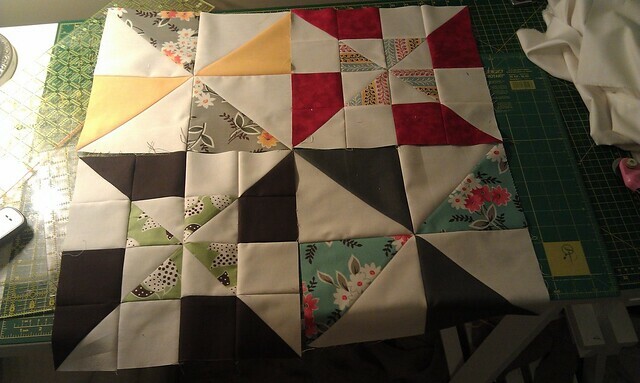 This one is her Pinwheel Sampler and I really like how it ended up. I'm particularly fond of the grey and red Dutch Pinwheel. 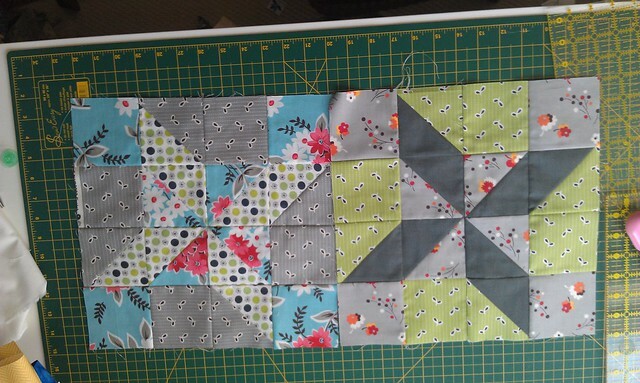 I've decided to do what many in the flickr group did - I'm putting pinwheel posts in the sashing. 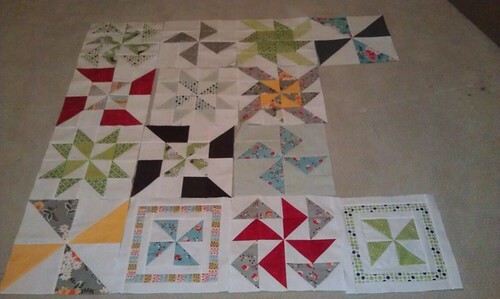 I got these all trimmed up and the next step is going to be sewing them into pinwheels. Almost done, and I can't wait. This quilt is going to be great. 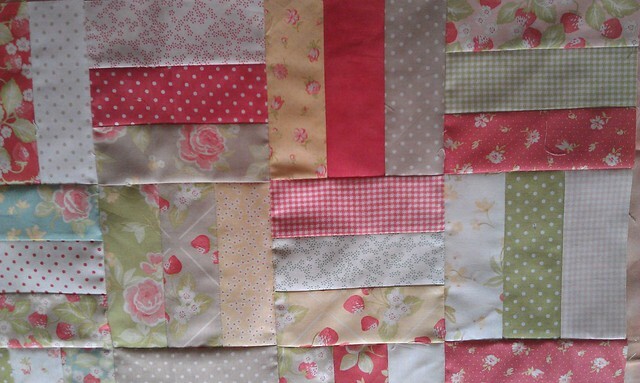 I've also been mucking about with my Strawberry Fields fabric. 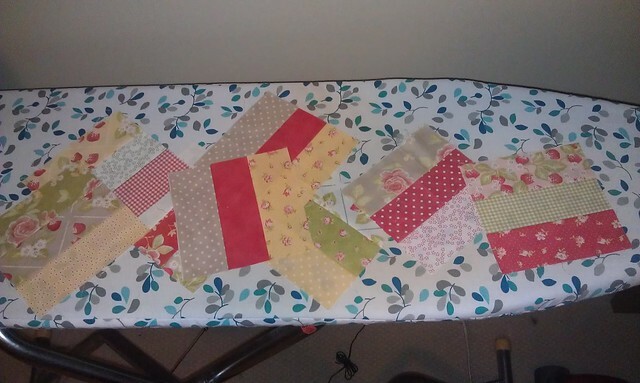 About a year ago, I'd taken my jelly roll and sewn the strips together. 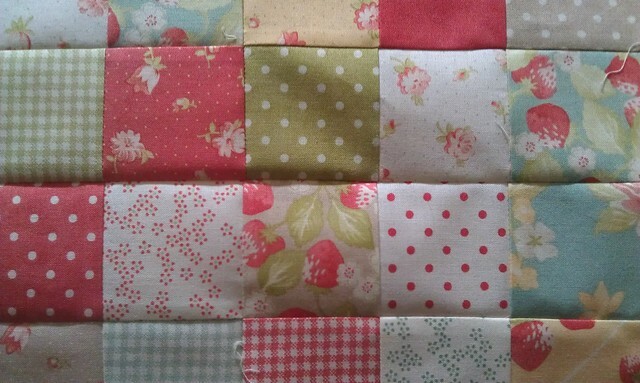 They looked okay, but when I threw them together in a simple roman square layout for a baby quilt, I didn't like them. At all. So they got thrown in a bag. 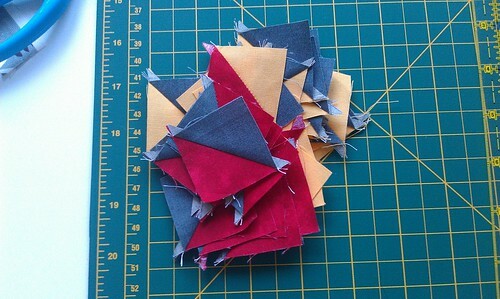 And at one point, I chopped some of them up smaller and sewed them together in a 2" finished square, 2x3 layout. I had plans for them, but I just wasn't feeling it so they all got thrown back in a bag. 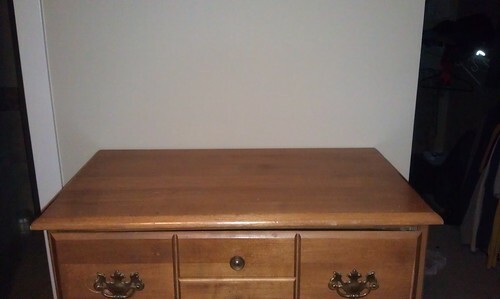 Until we pulled this dresser out of the basement and I decided I needed to make something colourful to top it. And I had these roman square blocks just hanging out. So I sewed them together. And liked them. But I had a dilemma. 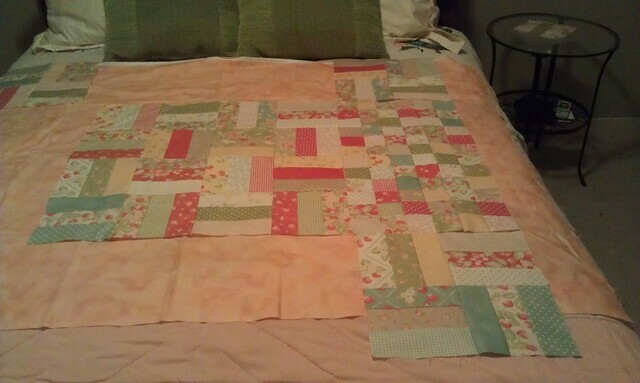 I didn't have enough of the roman square blocks to actually make an entire quilt, but I didn't want to use just a few. So, I played with it a bit. I'll be able to use all of the roman squares as well as the postage stamps I'd put together. I'll add some of the sashing fabric above and end up with a nice sized quilt, even if it isn't quite the normal colours I use.